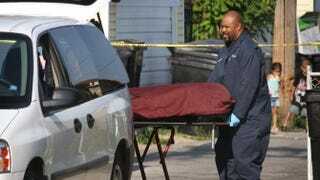 The body of a man is removed from a yard in the Kelvyn Park neighborhood of Chicago July 28, 2008. For every unarmed black man, woman or child killed by unrestrained police officers, there’s an intellectually impoverished response when black people get visibly upset about it: What about black-on-black crime? There was a time, in another surreal reality not so long ago, when conservative pundits reflexively grimaced at even the mention of it—and, oh, that whole notion that black people were unjustly shackled or slaughtered in advanced Western societies. Now black-on-black crime is a thing, with famous heavy-right rags embracing it as frequently as they knock the black president. It’s a fresh, new, nasty, stick-your-tongue-out retort to shut down any justifiable complaints from grieving black communities. Which means, sure, we can talk days on end about being black … so long as it pertains to black people hurting other black people. Others have signed on, too, including some prominent black celebrities and half-intelligentsia feeling ignored or irrelevant as the #BlackLivesMatter banner passes them by. Yesterday’s hip-hop mogul Sean “Diddy” Combs (perhaps toying with comebacks through Republican politics) kicked dirt with his own misguided reflections on it. Black conservative columnist Jason Riley, on a quest for more Fox News hits, riffs incessantly about it. And Cleveland’s black police chief, Calvin Williams, ineffectual to the point that he can’t or won’t arrest his subordinates for killing a 12-year-old kid, likes to occasionally drop hints about it when confronted or, as activist Deray McKesson recently noted, just angrily drops it when protesters get in his face. Fortunately, we’re in the midst of a rhetorical shift that is generationally putting “black-on-black crime” 6 feet under. It was incorrect during its creation in the 1980s, when many black pundits, preachers and politicians raced to coin it in every speech instead of putting relentless pressure on the nefarious trickle-down policies of the Reagan regime at the time. Let’s not forget that black Generation X used it, albeit reluctantly; black Generation Y has been smart enough to spit on it outright. Despite the intense national obsession with it, however, we haven’t yet come to grips with the fact that it never really existed in the first place. To refer to “black-on-black crime” not only defies common sense but grabs at baseless white racist science that removes blame for systemic deeds. There’s no more reason to assert “black-on-black crime” than there is to coin terms like “white-on-white crime” or “brown-on-brown crime” or let’s-just-insert-random-color-or-race-here crime. And, in case you haven’t noticed, we’re not using those terms. And we shouldn’t. Geography and basic population trends dictate that. Crime happens all around us, and it happens near where populations cluster. Over the past generation, we’ve allowed this unique, yet ugly designation of community crime patterns to stalk us like an angry ex-spouse, without any requisite understanding of how human beings live. That is to say, most African Americans generally live where other blacks live. So do whites. So do Latinos, and so on and so forth. One reason is that we’re so accustomed to congregating and living where others look like us. As the data-crunching Nate Silver recently pointed out, even the “most diverse cities” are the “most segregated.” A Pew Research survey released shortly after the election of President Barack Obama also underscored that point: Americans talk a big diversity game, but “American communities appear to have grown more politically and economically homogeneous in recent decades.” Interestingly, that same Pew study found that a larger margin of African Americans preferred living in racially diverse communities—83 percent—than whites (60 percent). University of Washington sociologist Kyle Crowder’s research has found that racial living patterns don’t match the diversity platitudes, either: Forty-four percent of African Americans move to black neighborhoods, with just 5 percent moving into white neighborhoods. For whites, the percentage is higher, with just under 60 percent moving into neighborhoods with people who look just like them, as opposed to only 2 percent who move into majority-black neighborhoods. Many of us may have graduated from predominantly white colleges, but we’re still living like a perpetual slumber party in the college cafeteria. This trend of residential segregation is, perhaps, the leading cause of persistent black-on-black-crime assumptions: Whites, still the dominant social group, are generally annoyed or perplexed by what they view as black self-segregation shattering the idyllic post-racial fantasy. Yet while that might seem like self-segregation, it’s not; it’s largely a result of available income, access to resources and, ultimately, necessity. African Americans are twice as likely to live in black neighborhoods, not because they necessarily want to but because, most of the time, they just have to. With limited social mobility in comparison with whites, most black families can’t just pack up, leave and move to Any Location USA. Instead, they find themselves in majority-black neighborhoods, many of which are ravaged by stubborn trends of low income, poverty, unemployment and underemployment. Oh yeah, and crime. But not because those neighborhoods are black “hoods” or black people are culturally or genetically predisposed to homicidal crime. Areas challenged by poverty indicators, as this Census Bureau American Community Survey analysis shows (pdf), are places where “concentration of poverty results in higher crime rates, underperforming public schools, poor housing and health conditions, as well as limited access to private services and job opportunities.” Some of the 10 most dangerous states in the nation admittedly have large—20 percent-plus—black populations concentrated in urban centers, but they’re also places with the highest poverty rates in the nation. It’s no surprise, then, that black residents sampled in a 2012 Public Religion Research Institute survey were 23 percentage points more likely to identify crime as a problem where they lived. That said, black homicide rates have dropped precipitously. But that’s not really the point, since race, ultimately, has nothing to do with it. Criminals are going to commit crimes based on opportunities offered by their environment and potential victims within close range. And it’s in that context that we discover, almost commonsensically, that you’re more likely to know who victimized you than not: According to the Bureau of Justice Statistics, 62 percent of nonfatal violent crimes that occurred between 1993 and 2010 were committed by nonstrangers. It could be a family member or the guy you saw crossing the street before he mugged you. As Gallup shows, a significant share of the entire majority-white American population, nearly 40 percent, is instinctively suspicious of areas within a mile of where they live. The three most dangerous states in America are Alaska, Nevada and New Mexico—all states ranging from 70 to over 80 percent white. And not so surprisingly, 6 out of 10 dangerous states are places with open-carry gun laws, which Stanford University researchers suggest contribute to an overall spike in aggravated assaults. Yet we’re loathe to call any of that an upward trend in “white-on-white crime,” just as you wouldn’t hear Russian President Vladimir Putin lamenting the rise in “Russian-on-Russian” murder rates (among the highest in the world, and higher than those in the United States). We’re quick to identify black crime as pathologically self-destructive even when it’s not. Yet we’re less quick on the draw when it’s time to address the urgent economic context that obliterates what was a ridiculous self-defeating narrative from the start.